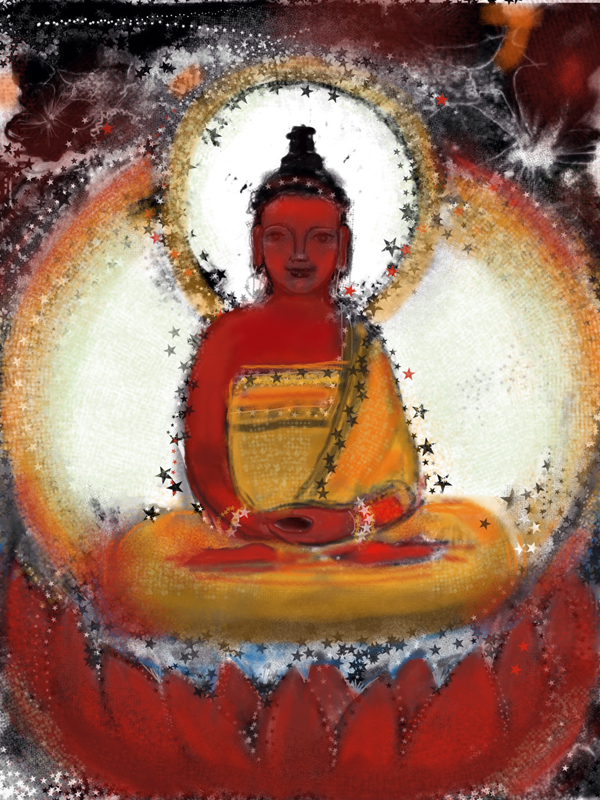 Here I'm exploring the qualities of the Buddhas and Bodhisattvas of the Padma (Lotus) family, a set of figures headed by Amitabha, the red Buddha of the West and of meditation. 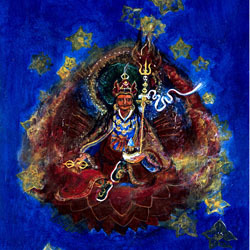 These archetypal beings embody a lineage of love and compassion. 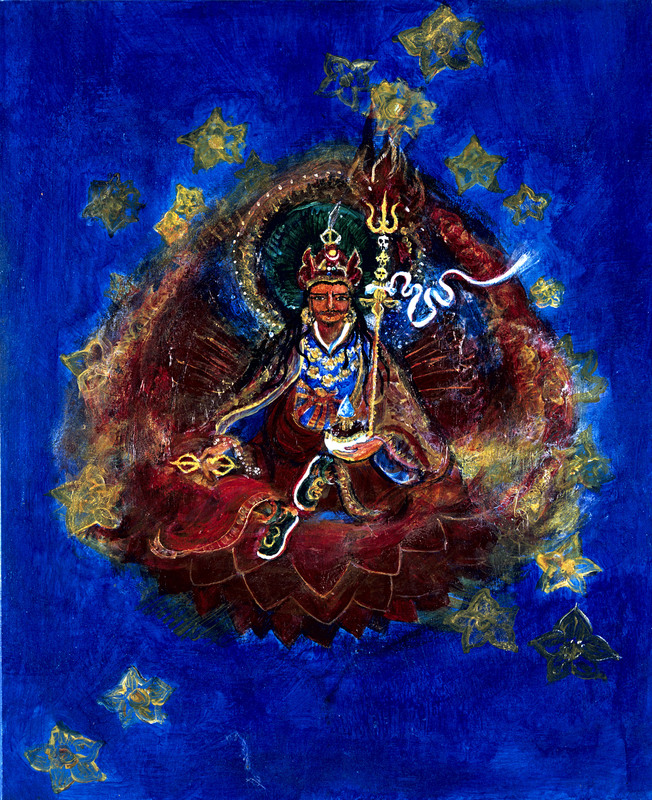 This painting of Padmasambhava is one of a series of miniatures. It is a precious jewel-like object and the image on screen does not do justice to the surface qualities of the piece. 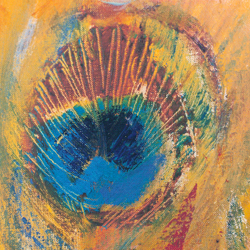 Iridescent acrylic paint, containing tiny particles of mica, gives the work a rainbow quality. The colour changes as light shifts, and viewpoint moves. Fine brushes were painstakingly used for the detail on the figure which measures just over 10cm (4 inches) from head to toe. 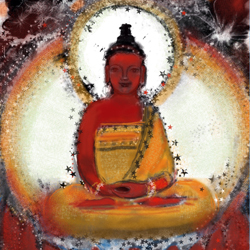 In contrast, the painting of the Bodhisattva and Lotus, from which the detail of the Bodhisattva's face comes is a large oil painting, (122cm x 112cm) which takes advantage of the sensual qualities of the medium. Part of the effect of the whole painting, when standing in its presence, comes from the size of the piece. 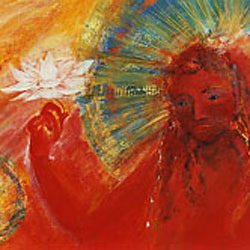 The viewer becomes immersed in a warm red colour field. Oil paint is a sensual medium. The full richness of colour and surface is missing from the computer screen. The choice of size and medium affects the outcome. During the physical, tactile process of making, forms emerge organically. There is an interplay between the subject and the elements of scale, surface and texture. 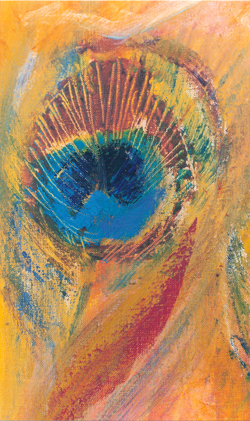 Here is a detail from this painting to show its texture. 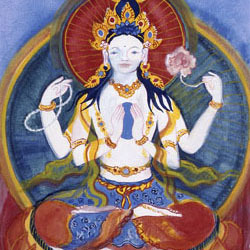 Amitabha, head of the Lotus family sits on a throne supported by peacocks: their feathers in the painting refer to Amitabha's elegant birds. 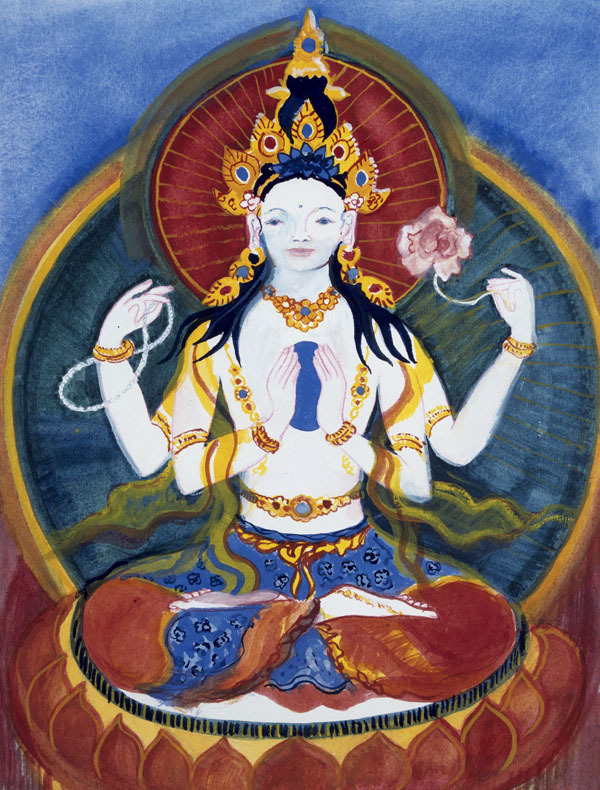 The gouache painting of four armed Avalokitesvara was a commission. 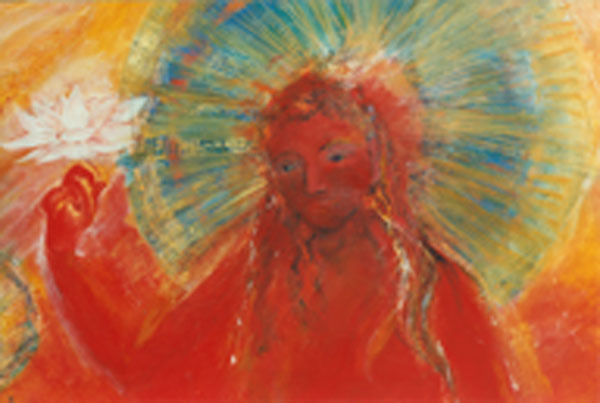 It is unusual in my body of work, in adhering strictly to the traditional iconography.